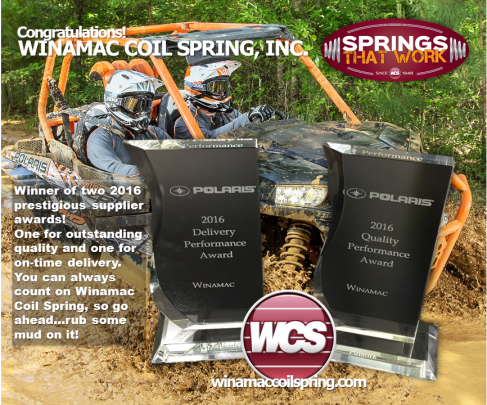 Polaris Industries, makers of industry leading off road vehicles, recently awarded Winamac Coil Spring with not one, but two, coveted awards. Winamac Coil Spring won the 2016 Quality Performance Award and the 2016 Delivery Performance Award. “It’s nice to have our entire team recognized by a major OEM like Polaris. Our hard work and dedication to making quality springs is truly the key to our success,” said company president, Tony Pesaresi. Congratulations to the entire Winamac Coil Spring, Inc. team on a job well done!